Printers will not be removed from classrooms as some had feared, rather a contract with Toshiba will change the ways copies will be made. With little funds for printing utilities, the Los Angeles Unified School District is signing a contract with Toshiba to implement new copy machines. 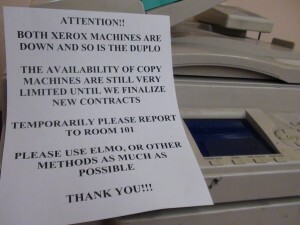 These copy machines will not remove all of the printers from each teacher’s classroom as feared by teachers and students. At the Sept. 24 meeting held by the School Based Management Committee, members voted to have this release with Toshiba. Students will still be able to print their documents from teachers’ classrooms, but copies and toner will be more limited. The machines that the school has now can only print roughly 500 pages per toner cartridge. We only have a $12,000 for printers and copy machines which are more costly when considering other printing utilities such as toner. “We need to conserve,” said Principal Sanchez during the meeting. Conservation and what the teachers and students need will help regardless of limited money. The only catch would be that teachers will need to physically go to a new printer for larger amounts at once. “The teachers have what they need for the students and Mrs. Sanchez is able to stay in her budget,” said Michelle “Hope” Walker, an SBM member. The issue on printers will be discussed at the next School Based Management meeting on Oct. 8, 2012.